An early paleolithic skull excavated in 1921 in modern Zambia shows evidence of being damaged by a high-speed projectile, which, considering the very primitive technology level of that age, seems impossible. The skull dates back to over 38,000 years ago and features a round hole measuring 1/3rd of an inch in diameter. No marks or “split-lines” are visible around the hole, which are common in instances of spear or arrow injuries. Curiously enough, the other side of the skull was almost completely destroyed, indicating the being was actually shot with some sort of firearm, such as a rifle. According to ballistics research, slow moving objects normally do not produce holes like the one found in this skull or fragmenting effects. Gunpowder, which is needed to create ammunition, was invented by the Chinese almost 2,000 years ago; the very earliest possible reference appeared in 142 AD, according to Wikipedia. But, just maybe, the primitive man was actually killed by a piece of then futuristic technology, such as a modern-day firearm or something equally as deadly. If this was the case, the final question remains: who… or what killed him? Perhaps that question has already been answered. Website Bad Archaeology posted an article back in 2008 which essentially debunked the various claims about the skull, which they call the “Kabwe Skull.” They claim the hole formed after the neanderthal’s death. Needless to say, this is an interesting take on the subject. We will leave it up to you to decide if this “Neanderthal Man” was “shot” by modern-day type weaponry or simply died by other means unrelated to the hole, as the other website’s author suggests. On June 26th, 2002, the Lanzhou Morning News reported on an unusual find in Gansu Province, China. They stated more than 10 geologists and physicists from various institutes had gathered to study the discovery of a mysterious stone. The man who stumbled upon it, Mr. Zhilin Wang, originally described the odd stone as being pear-shaped, approximately 6 x 8 cm in size, weighing almost 500 grams and, upon handling, feeling extremely hard. 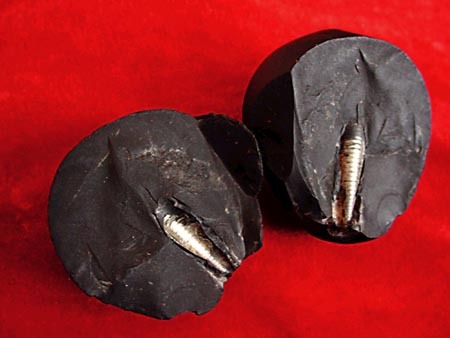 The most peculiar feature of the stone was the fact that a small metal bar, which was threaded much like a screw, was found inside after breaking it in half. Following an examination by the experts, they proposed quite a few hypotheses about not only the formation of the stone, but also how the artifact embedded inside could have possibly been there without some sort of unnatural intervention or trickery. Upon even further inspection, the scientists determined the screw-like metal bar was enclosed within the stone so tightly, the object’s entrance (which originally appeared as an exposed tip) could not have been man-made. Another item that could be included in the out-of-place artifacts category is an ancient Roman glass cup which dates back to the 4th-century AD. Called the Lycurgus Cup, its material is specifically composed of dichroic glass and gilt-bronze mounts. As for the chalice’s purpose, it is said it was only taken out for special events. The design itself showed “King Lycurgus ensnared in a tangle of grapevines, presumably for evil acts committed against Dionysus, the Greek god of wine,” according to the Smithsonian. Reported on various websites some time ago, a 270 million-year-old tablet deemed the “hidden words stone” was discovered in June of 2002 in the Guizhou Province, China. More specifically, the find was made in a largely untouched, isolated area near the village of Zhangbu. Surprisingly enough, Chinese characters originating from at least the 16th century were revealed when a large crack formed in the stone possibly due to erosion or other natural occurrences. It is not precisely clear when the stone split in half, which adds a bit of confusion as to whether this particular incident revealed the ominous message or if the message had already been discovered and an accident happened afterward. Back then, the people who stumbled upon this ancient relic only thought of it as a wooden toy since it featured bird-like decorations in addition to the fact that human flight (as we know it) had not been invented yet. It wasn’t until 1969 when Egyptian Doctor Khalil Messiha noticed the model closely resembled an airplane. Messiha had a fascination with birds and model planes since early childhood and pointed out a few peculiar discrepancies regarding this item: it had no legs, no painted feathers and no horizontal rudder (which is commonplace among birds). The model instead featured a very straight wing, located on top of the fuselage, and a vertical rudder, which is extremely important for man-made aircraft as it keeps them stable and moving forward. As you can see from the above diagram, Messiha believed there was originally a tailplane that was attached to the vertical stabilizer. This piqued glider designer Martin Gregorie‘s curiosity, resulting in him spending some time studying the Saqqara Bird and building an exact replica, with the exception of an added tailplane. Videos of his replica glider flights can be found here.